Numerous Eastern Box Turtles were inhabiting the courtyard that was to be the site of our bog creation project. We had heard legends of the duckling eating bullfrogs, but these little scaly gems had crawled under our radar. We wondered how they were surviving in habitat that supplied so few food resources for them. Thus, we had a shift in focus to accommodate this unique teaching opportunity and to provide a better habitat for these magnificent little creatures. 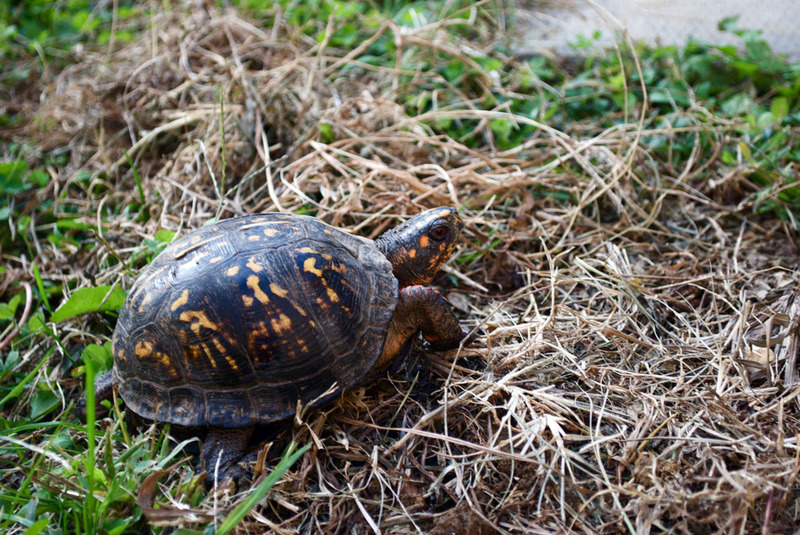 Eastern box turtle populations are severely threatened, mostly due to habitat destruction and roadway casualties. We encourage citizens to create turtle-friendly habitat in their backyards and to rescue turtles when you see them trying to cross the road. They get their name because they are the only turtle that can completely “box” themselves in when threatened by predators. Thus, this defense mechanism may be great against foxes and raccoons, it is no match for those lumbering piles of steel and rubber that take us to the grocery store. So when you see a turtle crossing the road, be a good samaritan and kindly give her or him a lift safely to the other side — just make sure it is in the direction they were already heading! Back to Carlin Springs — the turtles were not at all shy about accepting our offerings of fruits and vegetables. 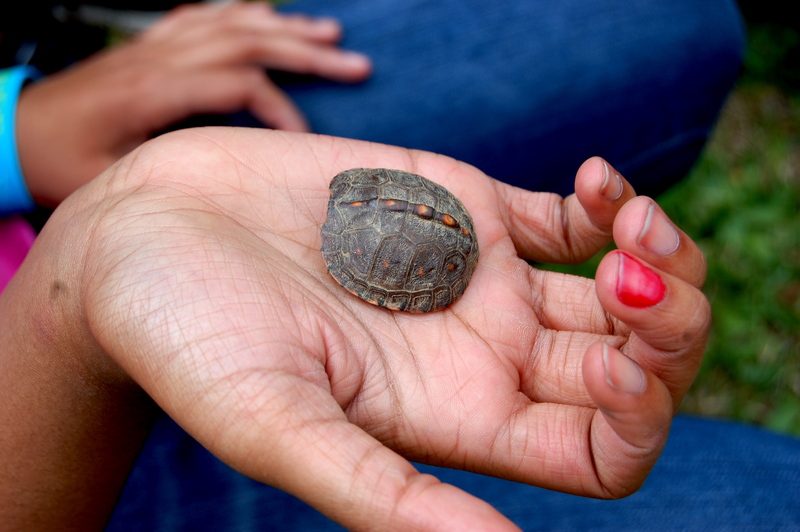 We began enhancing the courtyard and creating a better habitat for eastern box turtles. 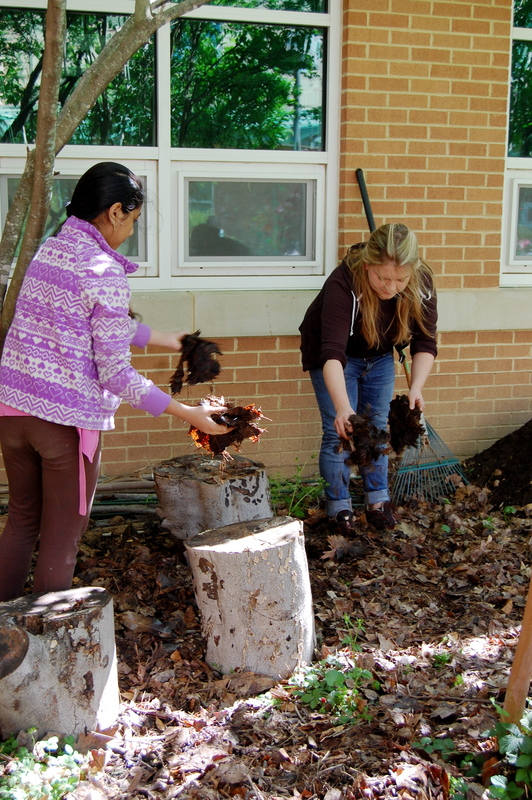 We brought in some rich compost and leaf litter to amend the soil. Also large logs rescued from a fallen snag to decompose and provide habitat for insects, fungus, and other yummy turtle snacks. 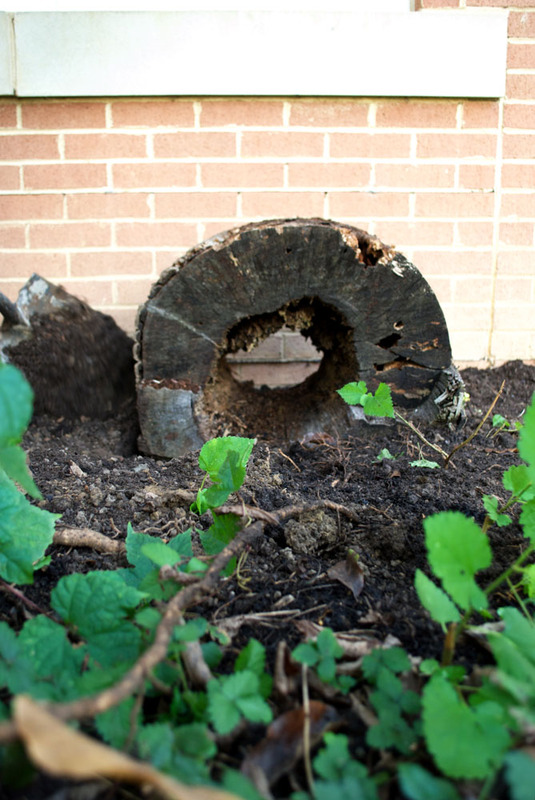 A few large hollowed out logs are brought into the courtyard to provide a protective sanctuary for the turtles during the coming chilly winter months. 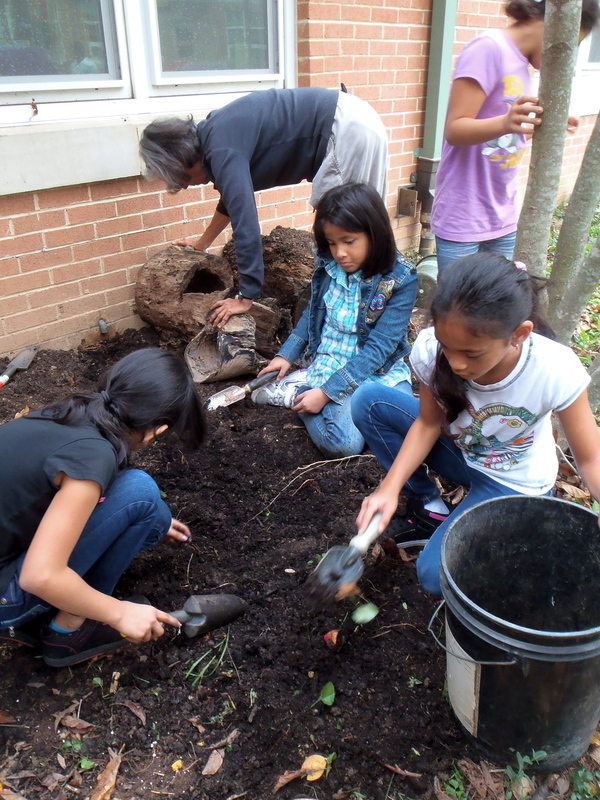 Members of the Carlin Springs Nature Club work in their courtyard to prepare the turtle hibernaculum. 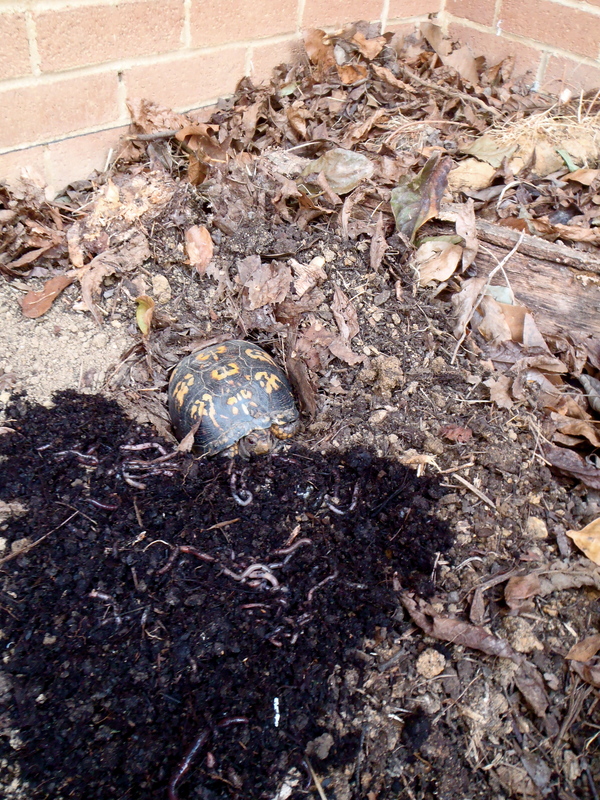 By combining leaf compost and shredded leaf litter students create rich soil that will retain moisture, conditions that are preferred by eastern box turtles. The mixture is then stuffed into the decomposing logs, which will also provide habitat for insects. 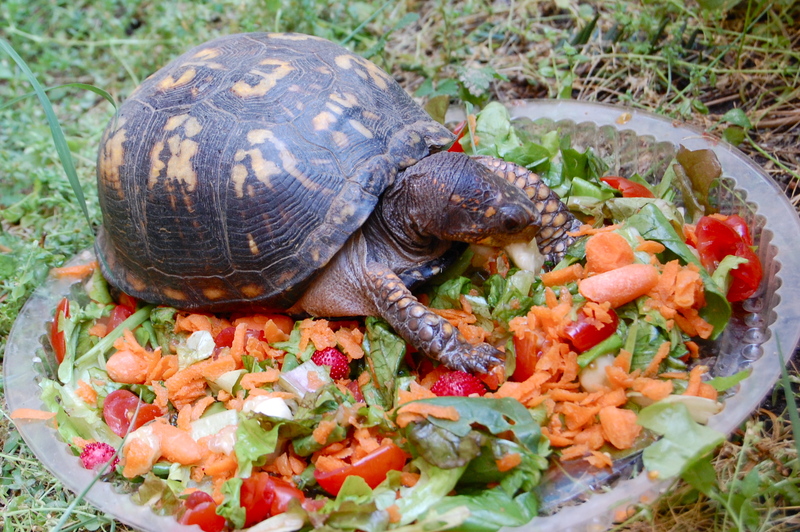 Although it is about the time for eastern box turtles in our area to begin nestling down for the winter, we still find a few of them wandering around the courtyard bog and chomping on selections from the platters of shredded vegetables and fruits we offer them. We often call it hibernation, that’s technically a process for mammal. Turtles and other reptiles “brumate,” when due to cold temperatures, the body metabolism slows down to use less energy — they are still awake during this time but become very sluggish. However, an understandably grumpy turtle was very unhappy that we woke him! We made sure to tuck him into some rich soil and cover him with leaf litter so that he could quickly burrow himself back into the earth.